On Thursday 6 March student nurses and midwives from around the country will take part in a protest march at Dr Steevens hospital in Dublin, headquarters of the HSE. The protest is primarily related to pay rates for student nurse interns. This is part of an ongoing USI campaign, conducted primarily via social media (#everyonelovesnurses) as well as the USI website. 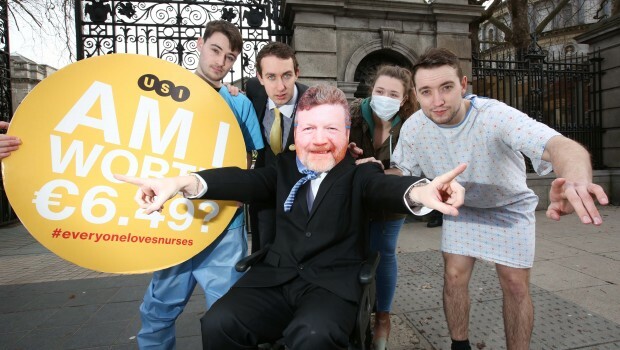 A key component of this campaign is case studies written by nursing interns detailing their working conditions, published on www.nurses.usi.ie. The campaign also incorporates the Graduate nursing initiative, at present the only option to work within the HSE as a newly qualified nurse. During their final year of training, nursing students complete a 36-week “clinical internship” across nine wards, during which they work 35 hours per week in addition to reflective practice. Although they are still students, these interns are also employees of the HSE. During this period of internship students are paid an hourly rate of €6.49 for the first 12 weeks, rising in increments to €7.79 for the final 12 weeks. According to the conditions of the internship period nursing students represent half of one qualified nurse in terms of nurse to patient ratio and ward staffing levels, and should be supervised in the care of their assigned patients. However, given the present chronic understaffing of wards, this is often not the case. The graduate initiative involves a two-year contract at 80% of the normal starting salary, representing a drop from €26,000 to €22,000. An educational component to the scheme has been suggested, though it remains unclear what this would involve, and what, if any, further certification could be gained. INMO president Claire Mahon has stated that the scheme sought to “exploit young professionals while expecting them to work, in areas of very poor staffing, without proper mentoring or support”. The INMO continues to argue that the pay-rates for student interns, as well as the conditions of the graduate initiative, are unjust, and has referred the present conditions to the labour relations commission. The LRC has acknowledged these claims and a conciliation conference is set to be held “towards the end of March 2014” according to the INMO. The planned USI protest comes shortly after the publication of a major study in The Lancet. In examining the relationship between nurse to patient ratio and patient outcomes it was found that the ideal ratio was 3:1 while a maximum safe ratio was 6:1. In Ireland, nursing interns find themselves in a situation where they are required to take on unsafe numbers of patients, at times 6 to 7 or more, while not being adequately supervised in their provision of care. As a result, the care provided to patients can, at times, fall below an adequate level. This is primarily due to understaffing, and while student nurses help to alleviate this disparity, they are not always adequately experienced to provide optimum care.